a mustache and still need to shave, how is your face doing? Does it feel tight and difficult to shave every day? Well maybe it is time to investigate some options. First of all we will not discuss the shaving creams that come in an aerosol can. These are cheap imitators of the real thing and create more harm than good over time because of the chemicals in these products. Yes, they are less expensive, but is your face worth more than going on the cheap? We think so! Also, this is not a discussion about straight razors, verses multi-blade razors! We will leave that for another discussion. So with that being said, let’s look at five differences. Your face may thank you. The first thing to know about shaving creams and shaving soaps is the water content! Shaving soap comes in a small puck or disk and requires the additional of water usually with a shaving brush to whip it into a lather to apply to the face. This will take some practice and of course requires some time in the process. Shaving creams come with the necessary water already in the cream. So whipping it up into lather can be quickly and easily accomplished. Shaving soaps come in the most predominate form of triple-milled hard soap discs. This means that the product is hard, and with adding the water and brush takes quite a bit of time to turn it into a really good lather. Once you become good at it, the best shaving soaps on the market produce a very rich, very soothing lather for a comfortable shave. Shaving creams (or Gels) come already packaged with water so working them into lather is almost without effort. Shaving creams come in a tube or jar and by substance are very thick. The cream can easily create lather with just the use of your fingers, although a good brush is still recommended. The shaving soaps list of ingredients was investigated to be well over 80 to 100 possible combinations and then some. A lot of different oils, butters and chemicals were in these possibilities. There did not seem to be any common ingredient so each manufacturer will use their unique proprietary mix. As you look at the ingredients, and which is best for your use, it is more trial and error by the shaver and what helps his face to get a smooth clean shave. It is also a matter of personal choice when it comes to environmental and animal rights concerns. Look at the ingredients if this is a concern. Basically, the creams or gels will carry a much stronger scent when applied than the soaps will. The different scents that these products can come in are well over 100. I mean literally, they come in so many that it will have to get down to the personal preference of the shaver. However the lubricating and ease of shaving properties should take precedence over the scent. Maybe one should consider the scent as the “icing on the cake” after considering the skin enhancing and preservation qualities. As expensive as these items can be, one should consider how easy it is to travel with. Not much of a problem unless you are going to travel by air. With today’s flight regulations in most airports, United States and Canada for sure the shaving soap is the big winner on this one. Do not make the mistake of taking your expensive shaving cream in your carryon luggage, as it will be too large of a liquid and will likely be confiscated. The truth is, that using and being comfortable with both shaving soap and shaving cream is a good idea for different situation scenarios. Although this was not meant to be an exhaustive article, it was designed to give the serious male who values his appearance both now and in the future an idea of the products available for shaving. If you learn nothing else from this, please take the time to quit using those cheap aerosol can creams, and take the time to pamper your face. It will thank you twenty years from now. Betty Norris. "Difference Between Shaving Soap and Cream." DifferenceBetween.net. January 31, 2019 < http://www.differencebetween.net/science/health/difference-between-shaving-soap-and-cream/ >. Whoever wrote this drivel uses an areosol can when they shave. Soaps and creams both require water and brush to lather. soaps require a little bit more water and patience, but the technique is the same. I think the person who wrote this is confused about the difference between actual shaving cream and areosol shaving cream. “One of the differences between a shaving soap and cream is obviously its form or consistency. Shaving soaps are solid in form while creams are semi-solids that are almost liquid-like but foamy. WRONG. CREAMS ARE CREAMY LIKE PUDDING, BUT THICKER. This is also the reason why shaving soaps need some water upon use for it to bubble up whereas creams need not be added with any kind of liquid or water when applied. You simply place it on your skin then you can immediately shave that area after a few minutes. WRONG. YOU HAVE TO LATHER THEM JUST LIKE SOAPS. Contrary to ordinary soap, shaving soap is really intended for shaving. Most of these soaps are less irritating and milder compared to regular bathing soaps. Thatâ€™s why itâ€™s perfect for shaving because these are specially formulated to counter the skin and hair traumas that might be brought by the act of shaving. WRONG. SHAVING SOAP IS FORMULATED TO PRODUCE A THICK LATHER UNLIKE REGULAR SOAP. Most or all shaving creams are like lubricants. SO ARE SHAVING SOAPS They serve to soften the facial hair for the blade to easily cut them. Creams also soften the userâ€™s skin and moisten the hair to be shaved. You can immediately tell the difference when you use such and when you shave without using any. REALLY? When you do the latter, the swing of each blade during a shave feels harder and more resistant to the point of feeling each hair being slashed or pulled one by one. BINGO. When you shave using a shaving cream, the overall experience is much pleasant because it is smoother and softer, not to mention painless. Nevertheless, shaving creams arenâ€™t really requisites. Itâ€™s just that you must have a very tough skin for you not to use such. WRONG. WATER LUBRICATES. THAT’S WHY MEN CAN SHAVE IN THE SHOWER WITH NO SOAP OR CREAM AND STILL GET A PAIN FREE SHAVE. In addition, there is also a difference in the quality of lather made between a shaving soap and cream. WRONG. Shaving soaps often produce inadequate lather that is inconsistent and overly runny. WRONG. Conversely, creams form enough lather that can make yourself look like youâ€™re wearing a white beard. SO CAN SOAPS. Also, creams are said to be the newer and more popular shaving products today. SAID BY WHO? Many have already understood that most recent cream formulations already include a soap component. REALLY. I WOULD HAVE SAID THAT MOST CREAMS ARE SOAPS THAT HAVE A HIGH WATER CONTENT. UNLESS YOU ARE TALKING ABOUT AREOSOLS, IN WHICH CASE I WOULD SAY THAT THEY ALREADY INCLUDE MANY CHEMICAL COMPONENTS, ONE OF WHICH ACTUALLY DULLS RAZOR BLADES. Nevertheless, both shaving soaps and creams are used to cushion the shaving action. YAY. IF YOU HAD STOPPED THERE YOU WOULD HAVE BEEN AHEAD. Both products aim to create a sort of â€˜layerâ€™ for shaving with a pH value that corresponds that of the skin (not too alkaline and not too acidic). UM, NO. THEY CREATE A ‘LAYER’ OF PROTECTION BETWEEN YOUR SKIN AND THE BLADE. 1. Shaving soaps are more solid in form compared to creams. 2. Usually, you need to add water to shaving soaps when you use them for shaving. This is for you to effectively create a good lather. With creams, you immediately apply them without the addition of water. HALF RIGHT. 3. 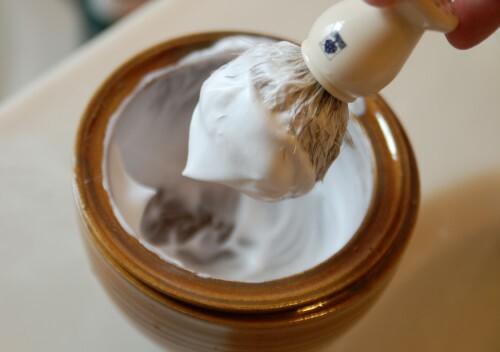 Shaving creams create a better lather compared to shaving soaps. 4. Shaving creams are more popular than soaps. Thanks Schick. Great reply and brilliant information. This is my favorite way to shave. It leaves my skin soft and smooth.